Home/ Shop By Brand/ Belvedere/ Belvedere ''2000'' Antique Scarlet Red/ Wine All-Over Genuine Ostrich Leg Belt. Belvedere ''2000'' Antique Scarlet Red/ Wine All-Over Genuine Ostrich Leg Belt. 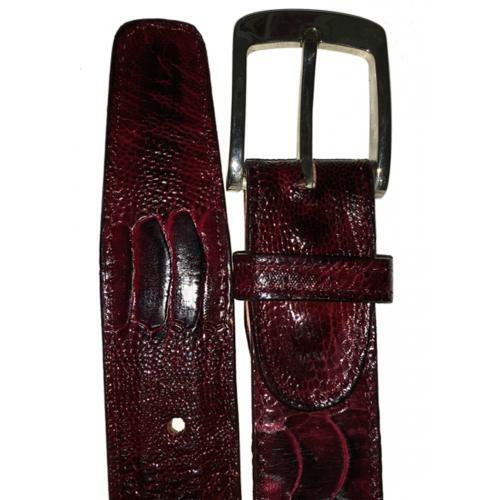 This exceptional quality Ostrich Leg skin belt is handmade by one of the finest exotic belt manufacturers, Belvedere. Belvedere offers sensational exotic belts that are completely hand crafted and hand stitched. Belvedere does not use the "painted-on" process to color this belt like other manufacturers; instead, they use a special tanning process to glaze the premium grade Ostrich leg.